There are many instances when provisionally installed TV receiving antennas produce perfect pictures at the CATV head-end. However, those situations are the exception not the norm. In the real world, CATV engineers experience mysterious Digital TV picture quality problems, which can be avoided or reduced with the proper technical information on hand. Many times the name of the city has no relationship to the actual location of the TV transmitting antenna. Channel 55, WHYY-DT is assigned to Wilmington, De. Measuring the distance and direction on the roadmap to Wilmington, De, WHYY-DT is more than 54 miles away at a bearing of 270º. Actually, the WHYY transmitter is not in Wilmington; the antenna is co-located with the rest of the Philadelphia stations at the Philadelphia TV antenna farm. The correct distance according to the computer-run, is 37.36 miles not 54 miles. The engineers do not have to install a separate antenna for the reception of Channel 55. WHYY-DT will be picked up by the UHF parabolic antenna with the rest of the Philadelphia UHF stations. Lack of technical information will lead to unnecessary expenses. The licensed output power of new UHF Digital TV stations varies widely from a low of 50 kW to up a high of 1000 kW. A prime example is the reception of Channel 39, Roanoke Rapids, and Channel 51, Greensboro, N.C.
Desired DTV station #2: Channel 51, Greensboro, N.C. In the case of Channel 39, the application of a single log-periodic antenna will result in unacceptable picture quality. The installation of an 8’ parabolic, for the reception of Channel 51, Greensboro, is excessive. Without the proper technical information, antenna selection is a shot in the dark – a costly shot. But this is not the entire story. Quite often the new DTV stations realize that their reception is not satisfactory, petitioning the FCC for new output power, higher transmit antenna, and even a change in location. The change in technical facilities does not happen overnight. With the proper warning there is plenty of time to compensate for a change, avoiding sudden deterioration in picture quality. Ordering yearly computerized head-end reception studies is a very quick and economical safeguard against suddenly reception outages caused by DTV station changes. A computer developed Signal Direction Sheet can present a welcome surprise for the CATV operator: a number of currently carried analog UHF stations and some of the desired new Digital TV stations are co-located on the same antenna tower or within the same Broadcast TV antenna farm. Consequently, a single large-diameter parabolic can receive all six Columbus or all nine Dayton UHF stations, with satisfactory signal levels and free of ghosting problems. The reduction of wind-loading on the CATV tower, the cost-savings in tower labor and installation is always appreciated by management. The proper orientation of the DTV antennas, ascertaining maximum signal levels and satisfactory protection against interference, is a task not to be lightly treated. 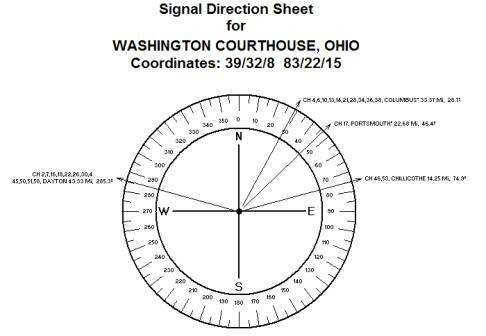 Of course, the need to know the exact direction and Azimuth Angle of the desired DTV stations is mandatory. The appropriate information is found in the computer-aided DTV reception study. Computer calculated directions exhibit better than 0.1 degree accuracy. Can a single antenna be used for the reception of multiple DTV stations, which are deviating from each other by a few degrees? Every situation has to be handled individually. As a general rule, less than five degrees difference should not cause any problem. However, with the reception of distant stations, requiring the application of large diameter parabolics, with highly directive radiation pattern, more precaution is recommended. At the time of antenna orientation, signal levels should be monitored simultaneously on all DTV stations to be received. The Federal Communications Commission (FCC) ruled that all new Digital TV stations should be operating simultaneously with their analog affiliates until 2006, when all analog stations must leave the air. A number of experts suspect that this 2006 schedule is a pipe-dream. There is no way to replace 150 million analog TV receivers with Digital TV sets within the next three years, even if the price is reduced from the current $2000 level. A more realistic date is 2010 or even 2012. Should the FCC insist on the 2006 date, the populist outrage, the calls to senators and congressmen could result in most commissioners and top staff members mailing out job feelers. From the CATV technical point of view, the ruling created a tremendous overcrowding of the UHF airwaves. With the current status of the UHF spectrum, CATV engineers can no longer rely on the customary safeguard of blank adjacent channels on both sides of the desired station. The current adjacent channel interference situation is unsatisfactory, becoming worse and worse every month. 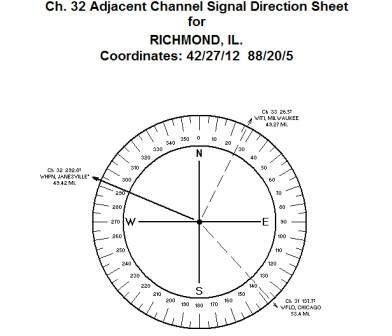 Consider the Channel 32 adjacent channel interference conditions at the Richmond, Il. antenna-site, as displayed on the signal direction sheet below. 49.92 miles from the antenna-site, the desired station, WHPN-DT, Janesville, Wi., is exposed to two (2) adjacent interference sources, Channel 31, WFLD-DT, Chicago, (53.4 miles) and Channel 33, WITI-DT, Milwaukee, (49.27 miles). The adjacent channel interference sources are just about as far away as the desired station. The anticipated intensity of interference is above average, requiring the application of a phased-array antenna. 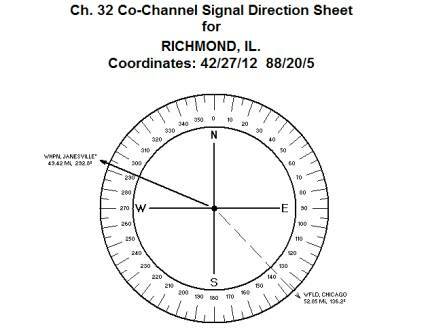 A Channel 32 co-channel signal direction sheet, developed for the same antenna site, displayed below, shows that the Channel 32, Janesville reception will be also affected by a strong co-channel interference, originating from Channel 32, WFLD, a very powerful Chicago analog station. The equidistance situation pinpoints toward more frequent and stronger co-channel interference situations. The Computer calculated adjacent channel and co-channel interference information has one shortcoming: lack of desired/undesired ratio information; too many reception parameters are involved in the theoretical study to provide a realistic prediction. The ultimate proof will come at the on-site interference verification survey. Such tests and measurements require top quality instrumentation, antennas with good radiation characteristics, and last but not least, many years of experience. The Testing Report, produced by the lowest bidder, may contain only virtual recommendations. Location, location, location is the buzzword in the real estate industry. Information, information, information are the key words for CATV systems involved in DTV reception projects.